A family whose capers with a bat in their kitchen went viral appeared on the Jimmy Kimmel show in the US last night. Earlier this week Tadhg Fleming caught the moment a bat entered his Co Kerry home. Tadhg's father Derry, dressed in football shorts and long woolly socks, tried to catch the bat with a tea towel and hilarity ensued as he chased the animal around the family kitchen. Eventually he managed to clear the animal from the room but not before Tadhg grabbed some hilarious footage. 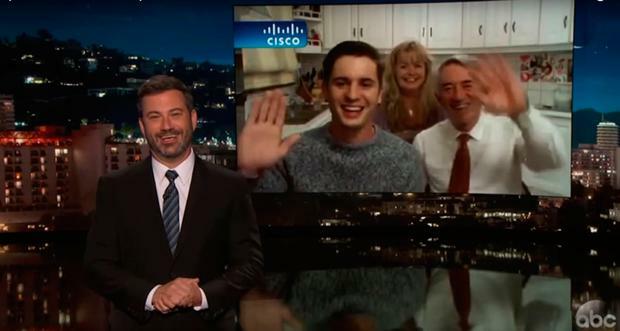 Appearing from the kitchen where the entire incident was filmed Tadgh, Maureen and Derry spoke to Jimmy Kimmel last night. The family recounted the entire episode and their dog, Basil, even made a cameo appearance. Tadhg said he considered leaving home but his mind was changed when he spotted his father taking on the bat in the kitchen "one v one". Asked what the family think about the success of the video, Tadhg responded: "It's absolutely crazy. People have been coming to the house taking photographs, they want to interview the bat." The family were asked about President Donald Trump and what people thought of him in Ireland. Tadhg responded, to laughs from the audience: "Who is that." The clip concludes with Derry doing an Irish jig sporting a pair of shorts.